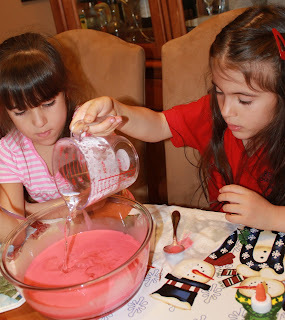 Google+ Mom to 2 Posh Lil Divas: Flubber! Gak! FUN! whipping up a batch of Flubber, or maybe you know it as Gak. this is a quick process so having everything on hand is best. I used two 4oz bottles so that both Lil Divas could enjoy pouring freely. 6. Add food color to your mixture. 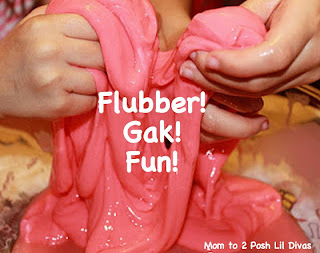 This is optional but it's so much more fun to play with colored flubber! 10. Mix - the flubber forms quickly so once you see it has initially formed dig in and mix well with your hands, adding water as needed until you get the consistency you prefer. I just dumped it out & we were left with fun squishy flubber. Now you get the PLAY! It's amazing how stretchy it is! 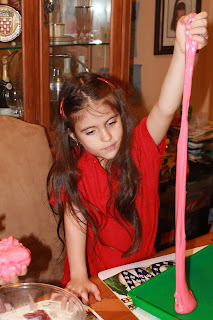 So how did the Lil Divas explore & play with their flubber? don't you LOVE those precious little hands?! and even made some quirky "masterpieces"
the Lil Divas just had lots of FUN playing! Store your Flubber/Gak in a ziplock bag for continued playtime fun. I finally found Borax here in Canada - so now I get to make this! where did you find it in canada??? Linit liquid laundry starch (has borax in it) and is much easier to use. Just pour into glue, add color and swirl. 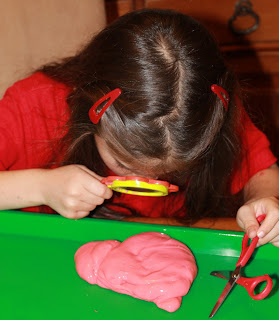 I like hiding "treasure" in flubber (small beads) for kids to find. Great fine motor activity. I love your "Mad scientist" theme you are doing! 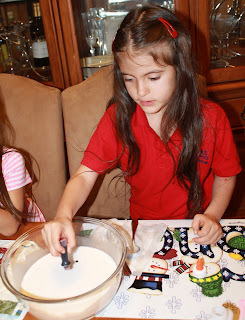 I think I'll have to copy you one week this summer, my kids would love these experiments! It has taken on a life of it's own over here! The girls can't get enough. I see lots more fun science in our future. This would be a fun theme to do over the summer! That's what I originally had in mind & we never got around to it and the girls kept asking about it so we just went for it! :) We are having a blast! I just wanted to say that I've fallen in love with your blog and I've only been reading through it for a few minutes. The activities you do with your girls look so fun! I've been getting a lot of great ideas for things to work on with my daughter- so thank you! You have seriously just made my day! :) What an awesome comment to read & I thank you for taking the time to tell me that & for joining us here. It's lovely to have you with us! More fun ahead!!!! This is just too cool! I'm pinning it for future reference. Oh I remember this from my childhood. Didn't know you could make it at home. Great! A few months ago we spent $ on silly putty and it was a smidgen of the stuff. We have a ton of it now - much more economical & fun since we made it ourselves! It's amazing what you can replicate at home! You must do it with your cutie pies! LOVE it! 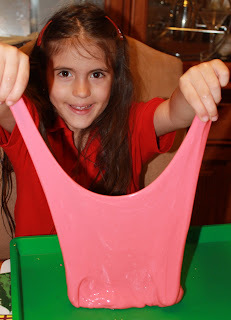 Funny enough, I just made some Gak yesterday at school and was planning to make it this weekend for my own boys! For a new spin, try clear glue...the Flubber becomes translucent. Also, for those who can't find Borax, a 1-to-1 mix of liquid starch and glue will provide similar results. we will have to try the clear glue next time! Thanks for the Borax tip - we had some overseas friends asking about that! Looks like you had a ton of fun with Mad Scientist week! We are enjoying your posts. 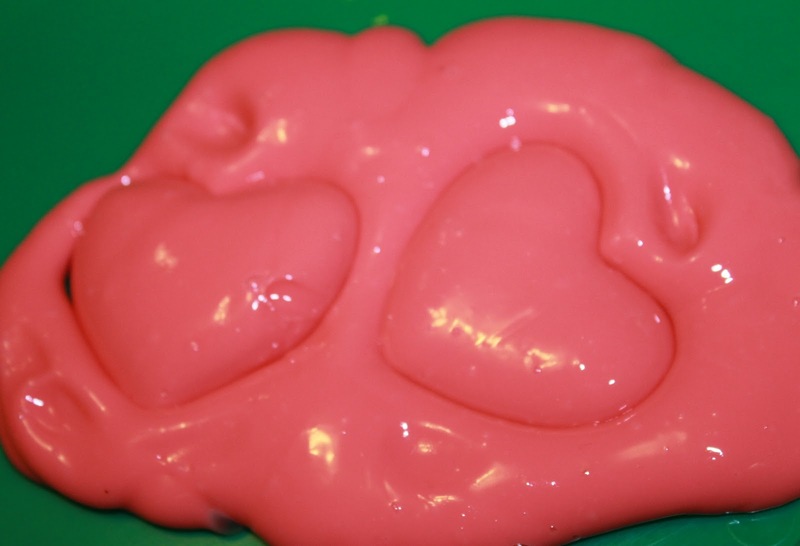 Love the imprints and your twist on making Gak. I pinned this under Science on my Pinterest site and people went crazy pinning it. Very cool. Great idea for older youth to relax after doing regimented homework-type activities. Isnt borax toxic? Ive been trying to source some in the UK and somebody mentioned on a forum that it isnt sold here as it is too toxic!! you can find it at amazon.co.uk! We had SO MUCH FUN. Thank you, thank you, thank you!!! My son and I made the flubber yesterday. 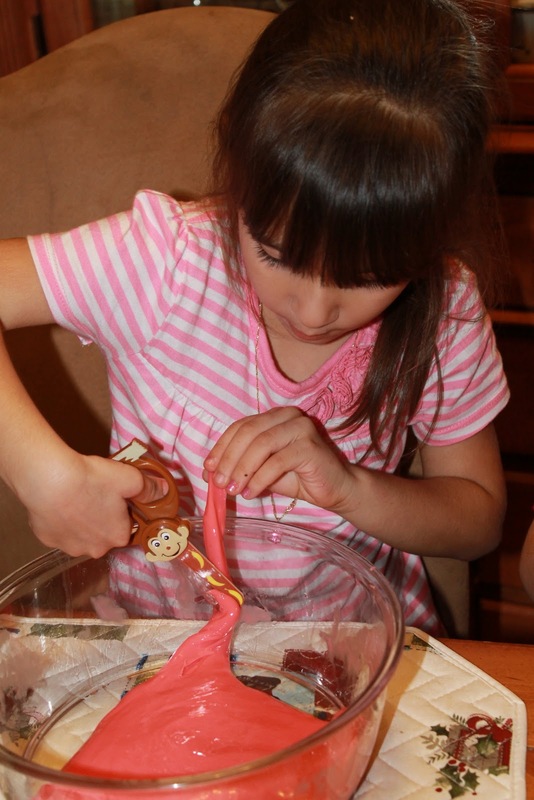 I looked at your recipe as well as Steve Spangler's but, for some reason, our flubber was not stretchy. Any idea why? When I made mine, I didn't mix my borax/water mix into the glue mixture. I just pour it in, let it sit, then reached in and pulled out the globs of flubber. We did work it for a few minutes and it turned out great. Hope this helps! I will have to try the substitution and see how it works out. Thanks for the tip. what a fun time you had with your grandson - what a lucky boy! The elmers definitely works best in my experience. Glad to see that you enjoyed it enough to give it another go! BTW, glow sticks in the tub are the BEST! A huge hit in our house too! FUN!!! I am doing a science party for about 16 children. How many times would you duplicate this recipe so that each child has enough to play with and take home at the end of the afternoon? I am in new zealand and don't have these brands. What is Borax? Can you use cornflour instead? Is PVA glue alright? Just made this tonight with my 3 yr old. we had a blast! making glow in the dark slime later and then a glow in the dark bath! your site is wonderful! Yesterday we did the ivory soap in the microwave. had to cut it into smaller pieces b/c our microwave is little. praised my couponing yesterday since i was wasting soap but it was okay since i got it for free with my coupons lol. thank you so much for some great activities! We just made this but ours is just falling apart. My son loves it anyway. What did I do wrong? This looks like a lot of fun! I am a babysitter that works more over the summer because of school and I am always looking for crafts and things like that to do with the kids...MANY THANKS!!! I just started homeschooling my 6th grader and we did this experiment today. It is very cool and she is still playing with it. How long will it last if you put it in the ziploc bag everytime you are done with it? When we make this in our class we keep it white. Each of the students uses water color markers to color it. This results in a marbled effect. Then comes the most fun of all. Something I have found that very few people do. Give everyone a straw (the kind that bends). Have the children make a flat sort of round tortilla. Lay the staw about halfway down the center of the gak. Leave the bendable end plus a little more showing out one side. Fold the gak over like you were making a taco. Pinch all of the edges together. Pinch the gak tight around the straw and blow. 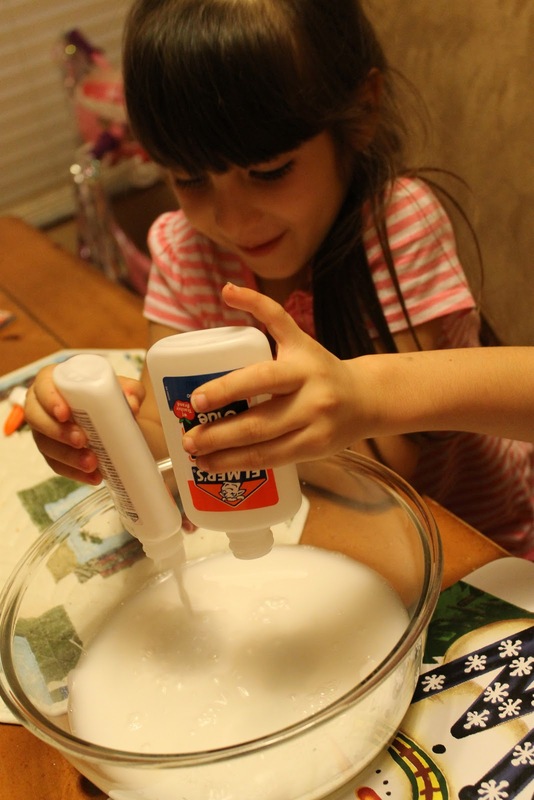 Leave the gak on the table to blow until you get good at making bubbles. Some kids can get them as big as 12" or more across. We store each child's in a sealed plastic bag. If they want to blow bubbles the next day I pull the gak out of the corners of the bag into the center and heat in the microwave for 10-15 seconds. It needs to get warm or it won't blow bubbles. It will last about 2 months. I work in a school setting and we can't use borax, I've found Metamucil (who would have thought) is a good replacement. My daughter made this and I put a write up about it and a link to your site. Great idea - thanks so much. My son loves this!!! He is 6 and loves science and experiments. And of course loves messy, gooey things. This turned out perfectly and was so much cheaper than buying similar "goo" already made at the store. Plus it makes a lot more. He literally plays with it for hours! We've made several batches in many different colors. He finds new things to do with it each time. The latest he loves is cutting it with scissors. Having sensory issues, it's great feedback for him. Thank you so much for posting. We've tried many of your experiments and love them all. I just made some for our 6 and 3 1/2 year old grandsons who will visit this weekend. My recipe called for 8 ounces of glue, and I think that is rather a lot for one tot. Older kids might like that quantity. I colored one batch with more food coloring than I would recommend. It seems to come off onto my hands. But it will be fine for playing with it at our granite kitchen island. HI I hope someone can help - want to make this with my Little Man (4) but we are in Perth Western Australia and we don't have Elmers Glue - does anyone know what I can use instead Please? I've done a bit of research and it seems that elmers Glue is just like what we call PVA - the white stuff. I'm giving it a o today! I just found your website do you have a facebook you post on as well? Thanks so much for this post! My two divas are having a blast this very moment with our own flubber/gak project:) Your directions looked beautiful and the pics were super helpful. Looking forward to trying out more of your experiments!